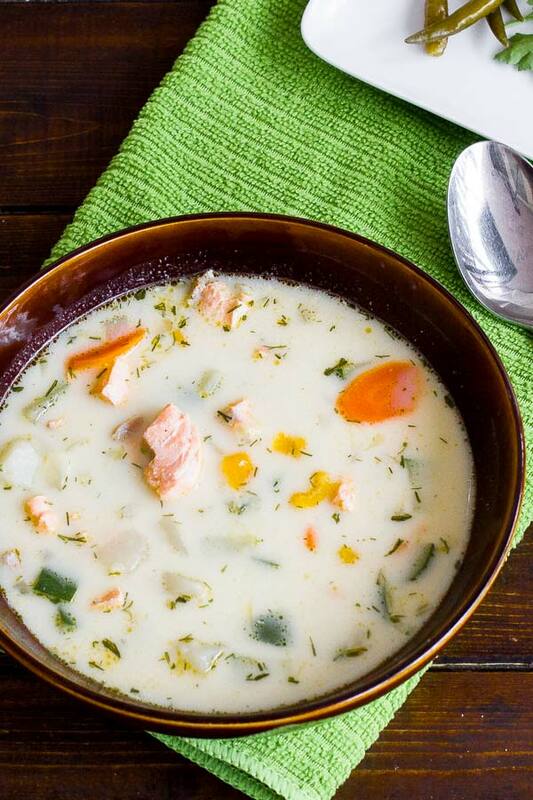 I have never tried a fish soup recipe before, heck all my cooking experience stretches as far back as 2 years ago only but, I always loved salmon and that was actually the impulse I needed to make this dish… that and wife that always bugs me about my Eastern European recipes which she can’t really get accustomed to. So here I am, going where no dude has gone before (at least not one without any cooking training), trying to make my first soup in which I had to put evaporated milk and I know is not a big deal for most of you, but the only dairy I ever used in my soup was sour cream, never milk. Now, I noticed a lot of people are making this recipe or some variation of it but most are using canned salmon which I don’t really like because it has a weird taste, so in my recipe I used a big piece of raw salmon, without skin and it was great, just needed to cook a bit more that’s all. Anyway, the thing is I like salmon and my mom used to make a killer fish soup (not with salmon though) and I was caught into a moment when I was in the mood to give it a shot on cooking myself and this recipe seem very good at that time. As a matter of fact, proved to be delicious and I thought it was a great substitute for my mother’s fish soup recipe, though a bit different in the end. However, it is definitely something to add to my recipe collection and a must try if you like a good chowder. Enjoy! Melt butter in a large stock pot over medium high heat. Add the onion and saute until translucent then add celery, green/red pepper and garlic and saute for another 5 minutes. Add the potatoes, carrots, stock, dill, salt and pepper; bring to a boil. Reduce heat to simmer, cover and continue cooking until potatoes and carrots are tender (15-20 minutes). When you are half way through the time required for cooking the potatoes, you can add the raw pieces of salmon. If you need more liquid feel free to add more chicken stock or water. Add evaporated milk and corn. Cook until heated through.